2 games and 2 losses. It’s been a tough start to the CLT20 for the Bangalore boys. Cricket can be such an easy sport when you are winning, and the difference between a win or a loss can be the smallest of margins. But what contrasting emotions they can bring. This contrast is never more evident as when you are playing in an IPL side. IPL teams are something else. Their supporters are fanatical. The adulation of winning is amazing. The cities seem to come alive, and the entire city wants you to be part of their lives. But the contrast is stark. When you are on the wrong side of the result, it can be a lonely place. Take this brief summation from one of my twitter followers: “Horrible bowling tonight v KKR. Very hard 2 accept this kind of bowling figure! RCB need to do better“. … Thanks buddy! And that’s just one of hundreds. 2 games to go, and 2 wins needed to stay in the competition. Are we good enough? I sure hope so. If history tells us anything about our side, we tend to make things hard. We like to lose a few games, be on the bottom of the table, and then come home with a wet sail into the finals. Let’s see if history can repeat itself. I, the rest of the team and the whole of Bangalore feel we can do it. I hope mother nature and fate are on our side. I let that half-written blog sit open for a few days on my laptop, and didn’t bother posting or finishing it, because frankly I couldn’t be bothered writing any more. But as I queried above, history did repeat! The last 3 days have been nothing short of spectacular. After crushing Somerset on the 3rd, we then moved on to the game of the tournament, and what many are touting as the best T20 game of all time. RCB vs South Australian Redbacks. If you haven’t seen any of the highlights, I strongly urge you to do yourself a favour and find that footage. What a game of cricket! I won’t go into the game itself, but talk about a bit of the off-field life. As a cricketer, you always have 2 mindsets that follow you around. There is: (a) the on-field ‘win-from-any-position’, don’t give up mentality; and (b) his poor, secret, often neglected and disagreeing off-field friend that we call common sense. These 2 guys rarely see eye-to-eye. I’ll be honest, before the last game against the Redbacks, common sense got a hold of me. I’d already been looking into flights home to the UK. The only positive of leaving a tournament is getting back to the family. I’d started getting excited to take my boy to his rugby this Sunday. We were 0-2, and not looking like winning. However, the ability of the RCB team to pick ourselves from almost certain elimination to qualify is a testament to the fighting spirit in the group, where we throw common sense out the window for a few hours, forget that we are on the brink of an exit, trust in our abilities, and try to turn our tournament around. And it’s a testament to the team’s ability to block out all our outside influences, and go back to the simple things. Here I am, CLT20 semi-final about 4 hours away, and I am about to cast away the outside world, the hype of the situation, and the expectation of the fans for a few hours while we try and win another game of cricket. The improbable and thrilling final ball 6 of the last game has taken me away from watching my boy at rubgy this weekend. Instead he’ll be watching me and yelling at the TV. The highs and lows of cricket are amazing. It’s a roller-coaster that only a privileged few get to ride. We cricketers live in a strange world, with extreme highs, combined with severe boredom and lows that make you wonder what you are doing. But I know that I’m privileged to be part of the game. Since last playing for Victoria in the One Day final in February, it’s been a roller-coaster ride. I was kicking back on the farm in Mansfield mastering my chain-sawing and fine-tuning my lagging social skills with old skiing mates around the fire, when I got a call from Andrew Hilditch. A week later I was on a plane as 16th man in the World Cup in India. You can read more about that iun my previous post. Next came my short IPL campaign. A short and sharp stint, as within 2 games, my season was over thanks to a nasty little side strain. The MRI facility that confirmed it was classical India. Whisked into a back street by barely competent drivers, a shack turned out to be the most high-tech imaging joint I’ve seen anywhere in the world (and as a fast bowler I’ve seen many). The poor 80y.o. local who most likely had been waiting 3 months for his MRI appointment was booted off the machine mid-scan so they could get me in there. My wife sat in the Radiologist’s room drinking Chai tea, and heard everything about the place from the excited owner. They were so proud of the place. As a bonus, they put me into the CT Scan machine to show me how cool it was. After a brief holiday in Goa with the family, we packed up from Melbourne and moved to the UK, where we are now happily settled. We live permanently in the UK, with the kids in school, everyone settled, and great neighbours. My wife has picked up her old sport of horse-riding (eventing), which could prove my financial undoing, but as they say ‘Happy wife, happy life’. We’ll see if that pans out. I was lucky enough to be involved with Surrey in the UK T20 competition. We had a great campaign, with a super talented squad, and only a stumble in the last few games cost us a place in the finals. Less exciting was the 100 miles each way to games and training. It was a tough slog, but it introduced me to audiobooks. A bit nerdy I know, but there is only so much commercial radio I can listen to at any one time. After the disappointment of being booted from the T20 in the UK, I thought I had until the Melbourne Renegades campaign in December to relax. But the life of a T20 player is an interesting one. The phone rang and a few days later I was off to Singapore for the ‘Olam Cup’ – a local T20 comp organised by the local Indian expat community modelled on the IPL with 4 franchises, and 5 overseas players in each side. Let’s get one things straight … Captains have always whinged about it being a tough job. What a load of crap! I captained the mighty ICS Lions to the title on my first try. (Search for ICS Lions on facebook and there are heaps of photos on there). A few great cricketing names were at Singapore in Shane Bond, Shoiab Akhtar, Sanath Jayasuriya, and some Aussies like Luke Pomersbach (WA), Liam Davis (WA), Rhett Lockyer (TAS), Michael Dighton (TAS), and a heap of other people who just appeared out of the woodwork. The last 6 weeks have been my first long break from cricket in what seems like years. I managed to sneak in a road trip with the family through Europe. A day or so before I set off, I heard from India that the rules were changed to allow me to compete in the CLT20 with Royal Challengers Bangalore this month. Previously, RCB and I thought I was ineligible as I was replaced by Chris Gayle, but in India, anything is possible. Seriously … what crap timing! I’ve got to get myself from the sloth of couch surfing and enjoying a beer, to being a tear-away quick in the space of 4 weeks. Family holidays, and French/Austrian alps aren’t conducive to fast bowling. After some hiking that I will put down as my ‘pre-season’ campaign, I made it back to London in time to again captain another side to a title. This time it was the ‘Rest of the World’ team in a game against England at the HAC ground in London – A cracking venue, right in the heart of London. It’s certainly strange captaining former stars like Jimmy Adams (West Indies), Saqlain Muhstaq (PAK), and others like hard hitting Irishman O’Brien, but I think we all enjoyed the day, and even better, the good guys won! Back in the UK, my already shortened ‘mini-pre-season’ were some damn hard yards. The local cricket ground is a lonely place by yourself on wet and windy days in the UK, but that was all I could use to get bowling loads in on most days. Other times I made it to Surrey for a bowl in the middle of The Oval for training. Time will tell if I’ve done enough to prepare myself – I think I have. Seriously?!? “Me a look fi cut ya now! !” Chris?!? What the hell does that mean? And who the hell understands that crap? Turns out it’s “I’m about to leave now”. I’ve got a lot to learn! I can’t end without mentioning my career sporting highlight that occurred about a month ago – The ‘All Out Cricket’ magazine September issue. Aside from it’s in depth articles on everything cricket related, it’s got a brilliant piece on the 27 Coolest Cricketers of all time. I’ve slipped in to 17th place, and best of all it’s above people like Chris Gayle (who was considered to be ‘trying too hard to be cool’). Makes for brilliant change room banter, and I’ll be showing this one to my great-grandkids when I’m in my cricket-induced wheelchair. 3 weeks in India, and my next appointment will be Zimbabwe in late November, followed by the huge Big Bash season with the Melbourne Renegades. I am absolutely stoked to be involved with such a young, fresh, high-risk/high-reward style of side like the Renegades. Whatever happens, it will be bloody exciting to watch us go at it on the field. What a team! I was looking forward to blogging most days whilst at the World Cup, but things just got in the way. Forgive me if I’m rusty. For starters, much of my time was spent coming to grips with the role of the 16th man in a world cup squad. Classed officially as ‘entourage’, I was left on my own to discover what a 16th man actually does. I’m yet to work it out, but I will keep you posted. As 16th man, I didn’t enjoy the common luxuries like the rest of the squad. The simple pleasures, like a room at each hotel, were often hard to come by without waiting an hour in reception because my name was not on the team list. More importantly, I didn’t get my name sewn in to my towels in each changeroom, or the fancy memorabilia that Tony Greig would call an ‘Original, 6 inch ICC Commemorative World Cup Replica Trophy’, complete with ‘Handmade Luxury Display Case’ that would no doubt be a collector’s item to be passed down the generations … I can just see Ricky’s grandchildren 45 years from now proudly displaying this dust collector in its original luxury display case. The flipside to these downfalls is the glorious stuff that comes with touring, the things that you can’t really explain to people unless they are there. One such instance was yesterday morning. 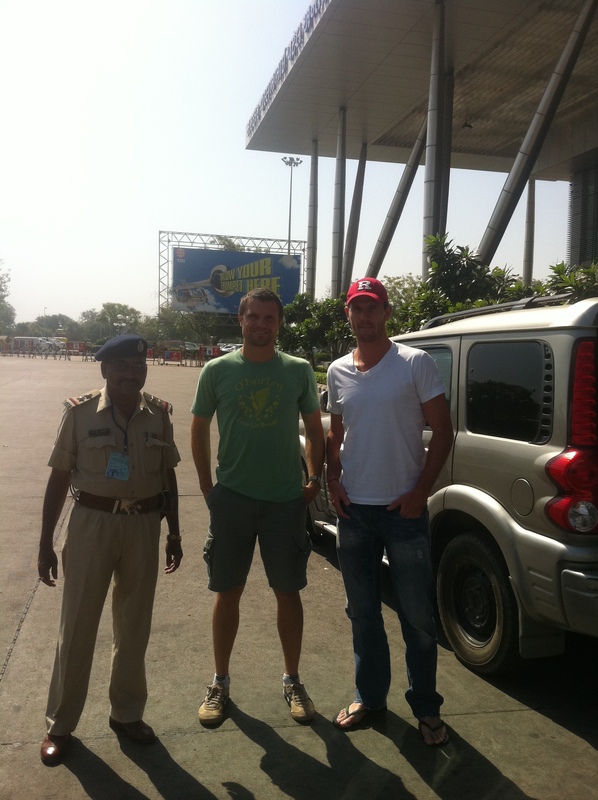 My favourite fast bowler (Shaun Tait) and I were waiting for our ride to the airport. The rest of the team flew out last night, but we were staying behind to catch different flights. When you aren’t part of the main touring plans, things just work differently – normally a lot worse. Uday our reliable driver’s job brief was to pick up 2 Australian’s from the hotel this morning. He did that most ably, but he took the wrong 2 Aussies – most likely just a couple of backpackers from Sydney who were wrapped to have a free car and driver for the day, cruising Ahmadabad in a futile attempt to find something remotely interesting. We were stuck, no ride, a plane to catch, and not enough time to do it … what the hell were we going to do? Gone was our standard bus with 4 police cars out in front, sirens blaring, announcing that a cricket team was coming through and that all within 500m should run quickly to the roadside to say Hi. But how our fortunes changed. The local constabulary came to our aid, and this time it was the stuff that kids dream about. Hollywood action in downtown Ahmedabad! We had a bulletproof car! A presidential motorcade! (maybe without the motorcade part as we were on our own, but it seemed at least 50% presidential, and lets not let the truth get in the way of my story). Now before you think Hollywood drama, it’s important you realise that we’re still in India, so it wasn’t your classic Hollywood 2 second getaway with tyres screeching. You see, when you are an Indian policeman, it’s important to make sure that when transporting any cricketers, you alert as many people as possible. Hell, call in your mates for a photo, get your hair gel out, put your best sunnies on, but lets just get on with it! “Yes Rajiv, those 47 people across the road can see you have 2 cricketers in the car … we can leave now … come on Rajiv, no need to call your mother-in-law to come and take your photo … yes Rajiv, you can have ‘one snap’ with Mr Tait in front of your car … no Rajiv, just get in the bloody car and drive already! ”. Christmas came and went, and then we started moving. When I was a kid designing my bulletproof car out of Lego, it had a massive engine. The kind of engine that Batman’s car had. When you put your foot down, it went faster than a Ferrari, screeching tyres, flames coming out the back and lots of noise. Today, Rajiv’s rocketship was an Indian Suzuki Vitara, with the engine from my Dad’s 1985 ride-on mower. Weigh it all down with a ton of bulletproof glass, and this ride was more like a sailing of the Queen Mary. For a boat, we made it to the airport in record time. A few well placed head wobbles to key people, and we were on our flight. I can assure you that there was no presidential treatment in seat 34c on the JetLite flight to Mumbai, but like all good flights, I managed to walk off at my destination. The World Cup is over for us, but it was a good time. Crap result, but a good place to tour as entourage. 16th man is not a bad job if you can get it. Who is this Aaron Finch character? He has shot into the Aussie ranks quicker than most, and it’s not without reason. Aaron Finch is a talented, likeable young cricketer who has a massive future in the game. But the ‘Alan’ Finch story is an entertaining one, and I was next to him on a desperately ageing Qantas plane to Perth and spoke to him a little about his cricket. Aaron is not your run of the mill, robotic cricketer that has come through the system. He is not the perfect athlete, and may have picked the wrong sport about 5 years ago. Why? I think he could have won the last Olympics as a track cyclist as he’s got a massive arse, and his legs would put most sprint cyclists to shame. But there would be one problem … Olympic cycling may not have liked him. He has a bit around the waist, thanks to a steady diet of ‘cans’ and ‘darts’ with his mates at the local. Going through the system, rather than be a ‘Yes man’ like so many trying to ply their trade in Australian colours, Aaron has done it his own way. He has a refreshing ‘tell it like it is’ attitude, most likely developed from his time growing up in country Victoria. Recently, he had a run in with former teammate Nick Jewell who from all reports was ‘being a chop’. Finch told Jewell some home truths that no one else had the gall to say, Finch got whacked, but rather than punch back, ‘Alan’ stood his ground and kept firing back with only words. And I like that in a cricketer … a bit of niggle … someone with honesty, and who doesn’t mind picking a fight so long as it helps the cause. I enjoyed a recent T20 game at the ‘G when Nesser from QLD bowled his first ball for the game. Finch smashed him for 4 and quickly walked down the track telling Nesser he was ‘going down today’. Seriously, how many times do you see that on TV these days? Not enough, and I love it. Australian sport in general has become a bit of a nanny state – no one can have their own point of view, no one can have their own colour, no one can sledge or make comment in the media unless it’s promoting the next ‘big game’ or goodwill cause. My personal highlights of games are when things get nasty on the field, when feelings come into a game. Finch brings that feeling into every game he plays. He puts the fun back into cricket. After all, isn’t that what we play the game for? Never one to back down, Aaron has always been the bad boy to the Victorian cricket administrators. Right or wrong, he’s the guy who was first pointed at by the coach if the entire team was out the night before the game. Apparently it was always Aaron’s fault. Maybe the finger was pointed at him because he always told the truth, rather than the standard practice of hiding away and blaming others. However, you have not come to know Aaron because he is a good bloke. At the end of the day, it’s about his cricket, and oh how far he has come. Aaron Finch has developed his game to become a shining light of Australian cricket youth. He is an outstanding team man, with knowledge of the game beyond his years. He has learned his craft under the best in the business in Hodge, McDonald, Shipperd, Hussey and White, and has been given ample opportunity to develop his game. Victorian coach Greg Shipperd thinks so as well, picking up Aaron for $300k in the recent IPL auction for Delhi. While most would not look too much into this result, on face value Shipperd put a lot of money into buying an unproven cricketer on the big stage. Shipperd is a good judge of talent, and along with most who have seen him feel he has far bigger things to come. Since the auction, Finch debuted for Australia, and whacked them everywhere. He looked un-nerved on the field, a confidence that he rightly developed over his last few seasons with Victoria. I ask him about his feelings in his first game, and fortunately he was shitting bricks like everyone else would. How far will Aaron Finch go? Time will tell, but I’m tipping he won’t be playing much more for Victoria, instead donning the Australian colours in all forms of the game for years to come. Yes, he drinks. Yes, he smokes. Yes, he blows bubbles with his gum when a bowler is running in to bowl. Yes he picks a fight with his quick mouth on the field. But he’s a damn fine cricketer and will always be one of the first picked in my team. I had the pleasure today of sitting next to Bear as he received the call he was the new Australian captain. He tried to act cool, but I could see his mind turning, trying to come to terms with what it actually meant to him, how his life would change. I can only imagine the thoughts. We sat chewing the fat for about 20 minutes on the issue. Does he have a say at the selection table? How much influence on the side does the captain actually have? Can he make changes? Is the style of Australia’s play dictated at all or even influenced by the captain? Or is he just the fall guy when things go pear shaped? What happens when you are announced as the Australian captain? How does it actually happen? What graces or perks are given to an Australian captain? The first thing I know is that Qantas flight staff do NOT allow Australian captains to receive the news over the phone during a safety briefing. We sat on the tarmac in Melbourne being told where the exits were (we’re sitting in one now Susanna, so thanks love, but I think we already know where it is! ), and NO, Hilditch’s call is not more important. At least we know that cricket isn’t the be-all and end-all in life. But I think we already knew that. We also know that the Australian captain of T20 is not allowed to have the seat written on his boarding pass. 11a and b were taken by two very respectable looking retirees who were not going to move. Bear has learned to pick his battles, and this was not one of them. Many of the on-field, cricket specific answers will only play out over the next week, and we can only hope that politics will not get in the way of his leadership style. Any Australian dressing room has a lot of egos to fit in. I know Cameron is well liked in those circles, and I trust that his appointment will be met as positive news by everyone on the team. All I can hope is that Cameron takes his captaincy style from Victoria with him on the National team. He is confident, self-assured, and a natural born leader. His cricket brain works faster that most, and with Victoria he has been in charge of a winning side for many years. He knows how to win. Maybe his hair needs a little work, and he can stop using “obviously”, “I suppose” and “I guess” in interviews, but fortunately at last check these were not pre-requisites of the job. Who knows what’s going to happen now. Probably the only thing that is certain at the moment, is that Cameron’s fishing boat just gained a few extra feet, and that he will be a very busy boy for the next few days. I wish Bear all the very best in his new position. Long may he retain it, and may he lead the Australian side to success in the very near future. I just hope I can be a part of it as well. Another great win from the guys last night. With Hodge and Finch at the top of the order whacking them around the park, it was always going to be an easy game for the bowlers. For anyone watching the game, the slog by Finch on the last ball of the first over was a huge shot in the context of the game, and contrary to his recent warm-up game form, it came out of the middle. Good hitting Grinch! He was 3 for 5 in the 2 T20 warm up games, including a first baller to me which gave me much pleasure. Once you are 100 after 11 overs with 9 wickets in the shed, it’s always going to result in fireworks, and Huss and White put on a good show. The bowlers were consistent as always. In all a good win, and a great percentage booster. Next step is training today – why train after a game I ask? I guess thats just the lot of the modern cricketer. If it keeps us on the park and winning, then I am happy to be involved!